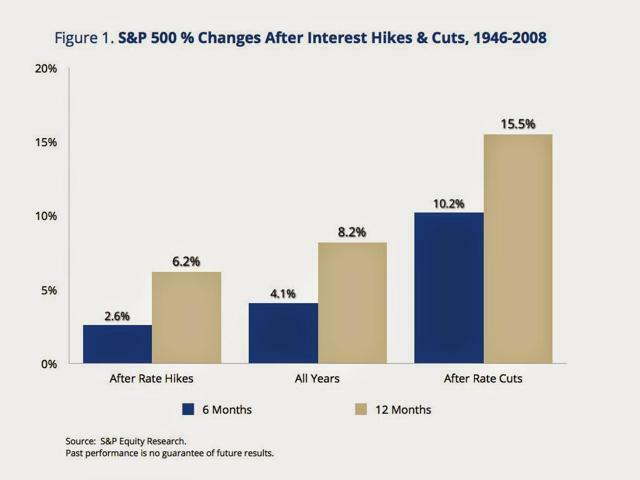 Interest rate hikes do not necessarily impair equity returns. Strong dollar helps FED with its monetary tightening. Investors are obsessing over a 25bp rate hike when they should be focused on the long term. In a high tech world where we demand everything instantaneously, sometimes it's good to just sit back and be patient. The topic of whether the FED would remove the word "patient" and set the stage for an interest rate hike in June or September has been discussed ad nauseam. Granted this was a historic meeting as the FED prepares to potentially raise rates for the first time in roughly 9 years. Although equity markets have historically had some type of pullback or correction leading up to the initial rate hike, as this chart shows, returns are generally positive 6-12 months following the first rate increase. Furthermore, even though the FED removed "patient," we feel a rate hike will not happen until September at the earliest. 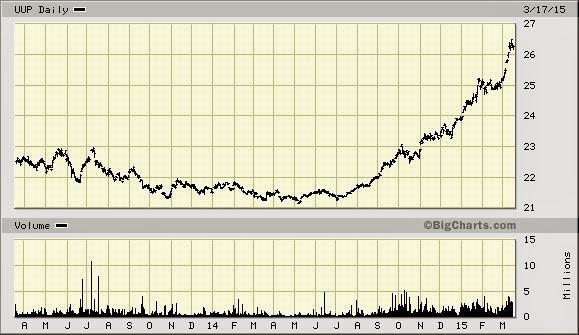 As this chart shows, the dollar has been surging, which has to concern the doves. The stronger dollar essentially slows GDP growth and contributes to deflationary pressures. If the strong dollar is doing the FED's monetary tightening for it, why rush to raise rates? At the end of the day, investors are obsessing over a potential 25 bp rate hike that is probably irrelevant. Monetary policy will remain extremely accommodative for a long time, which should continue to benefit equities. That being said, markets will remain volatile as we have been saying. A strong dollar world causes volatility as traders debate the negative repercussions on emerging markets and profits for multi-national companies. This volatility is a healthy process and provides opportunity. We have just forgotten what volatility is like as central banks have suppressed it for so long. So as the market obsesses over "patient," and a pullback or correction potentially happens in the next several months, we like to remind ourselves that the long term bull market remains in effect. After the initial smoke clears, equities generally outperform in a rising rate environment (up to a certain point) as the economy is getting stronger. Eventually rates will reach a point where they have a negative impact on equities, but that point seems far away. This article is distributed for informational purposes only and should not be considered as investing advice or a recommendation of any particular security, strategy or investment product. The author's opinions are subject to change without notice. Information contained herein has been obtained from sources believed to be reliable, but are not assured as to accuracy. No part of this article may be reproduced in any form, or referred to in any other publication, without express written permission of Carbide Capital Inc.
Past results are not necessarily indicative of future results. There is neither representation nor warranty as to the current accuracy of, nor liability for, decisions based on such information.